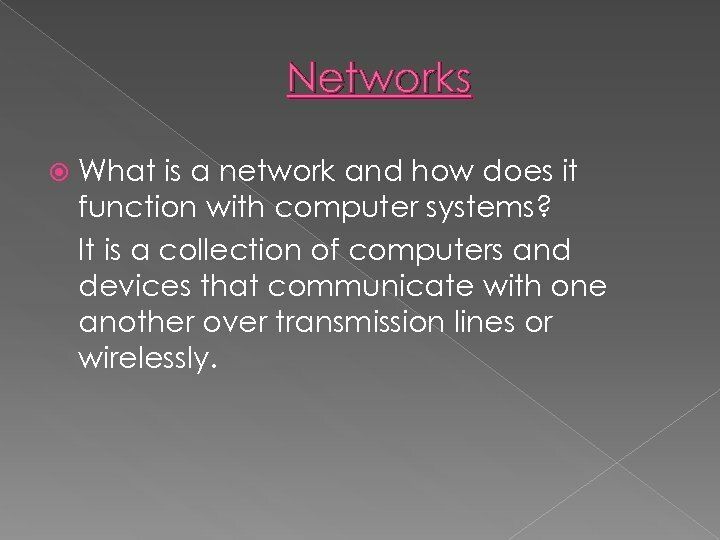 Networks What is a network and how does it function with computer systems? 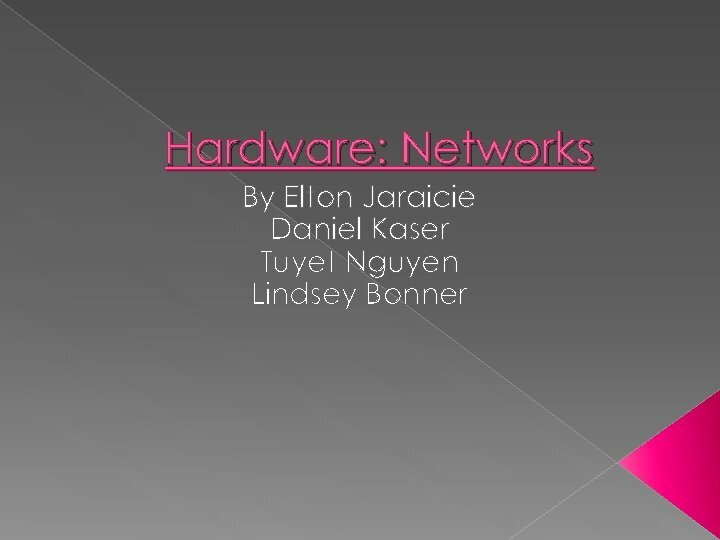 It is a collection of computers and devices that communicate with one another over transmission lines or wirelessly. 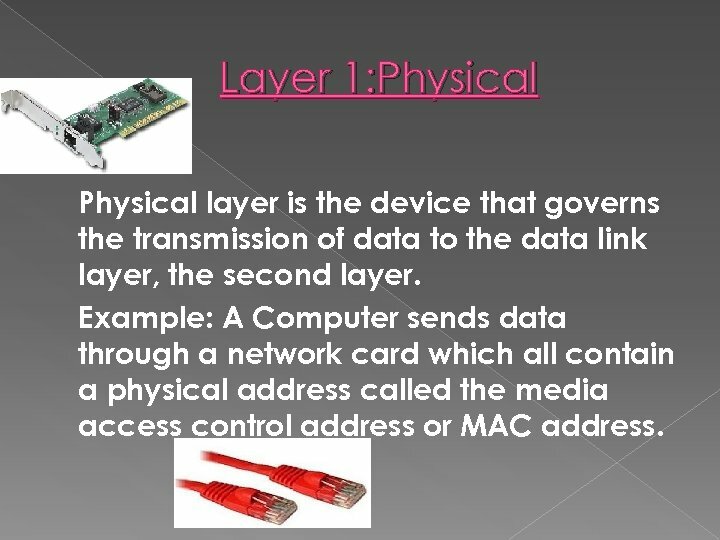 Layer 1: Physical layer is the device that governs the transmission of data to the data link layer, the second layer. 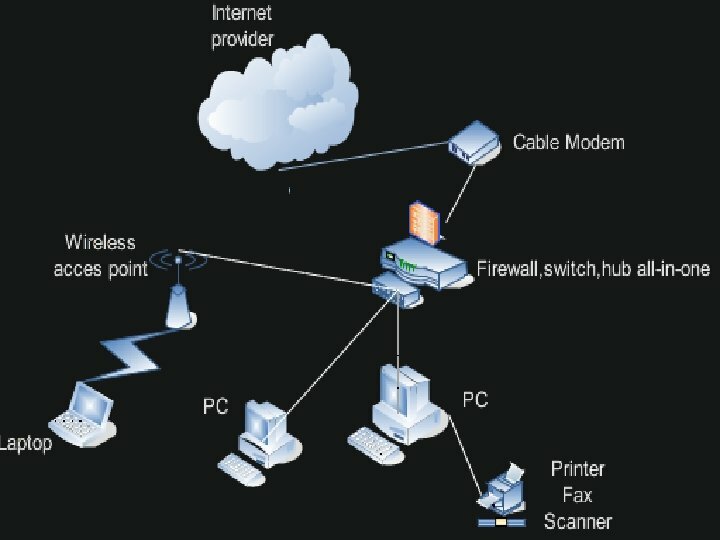 Example: A Computer sends data through a network card which all contain a physical address called the media access control address or MAC address. 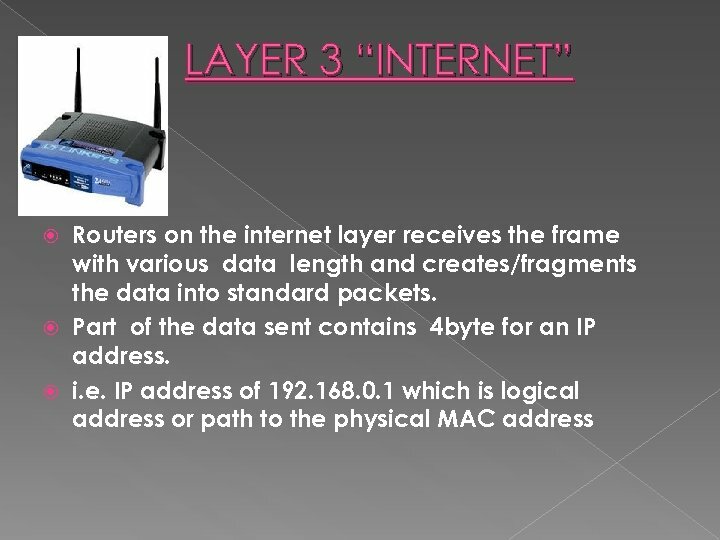 Layer 2 “Data Link” Directs data from layer 1 including physical address(MAC address) to layer 3 via frames. 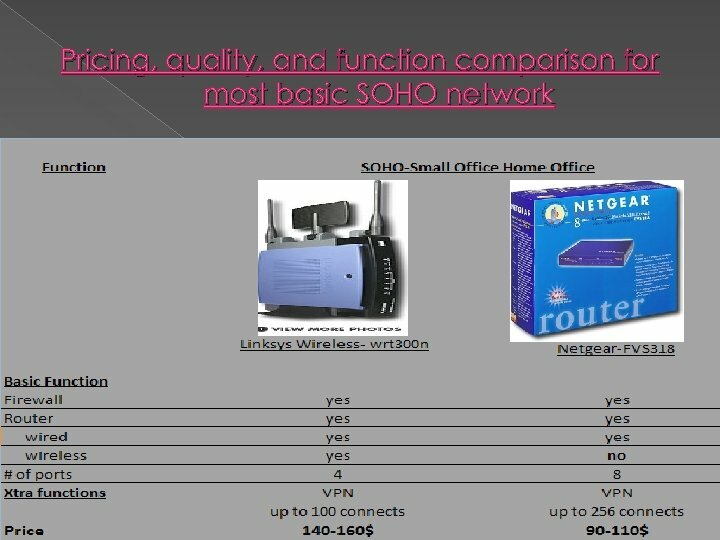 Example: A Switch in a mid to enterprise class company are separate devices but at home they are built into the firewall/router/cable modems. 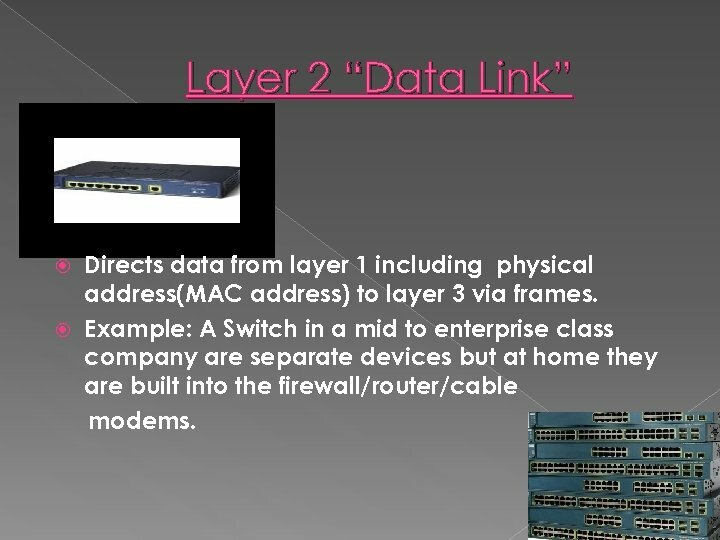 Layer 4 “Transport” Layer 4: transport layer-router provides reliability between users during transport via various protocols. Provides error correction. Novell, Windows, MAC, Linux and other platforms sending data will have data sent with compatible standard Notice no picture? 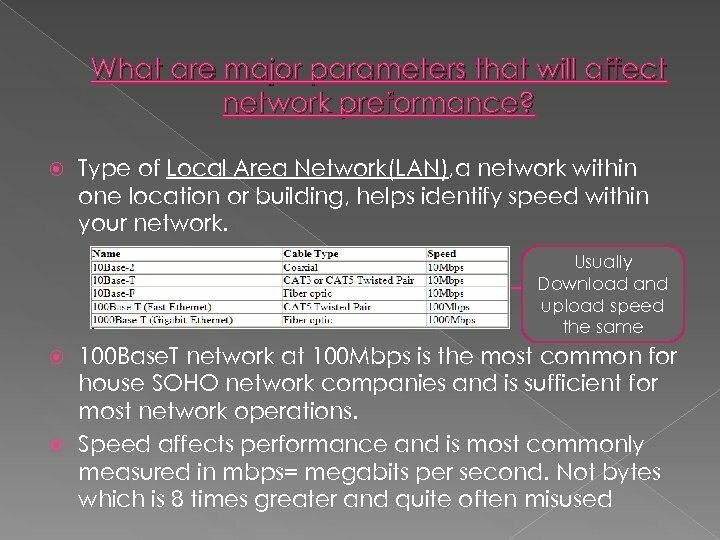 All virtual-data is not moving in OSI model but affects performance such as latency, which is a parameters we will talk about shortly. 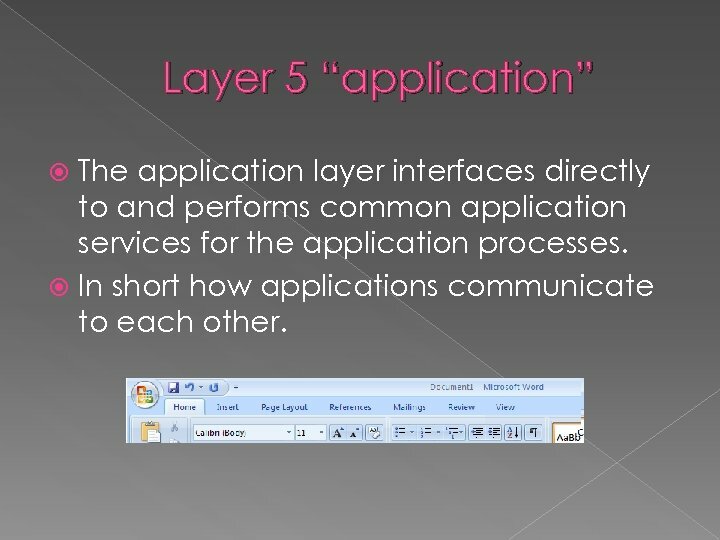 Layer 5 “application” The application layer interfaces directly to and performs common application services for the application processes. In short how applications communicate to each other. 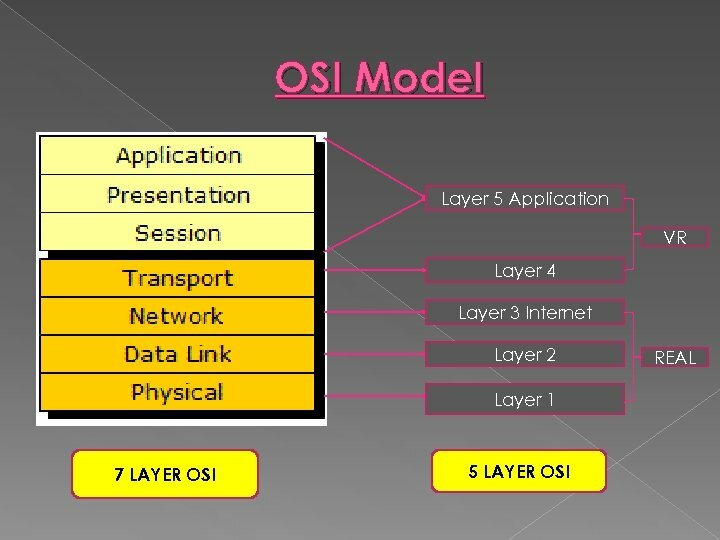 Why Describe networks via the OSI model? Because it give both the technician and the manager an overview of the network and network traffic so they can make informed decision that attain the current and future goals of the company. 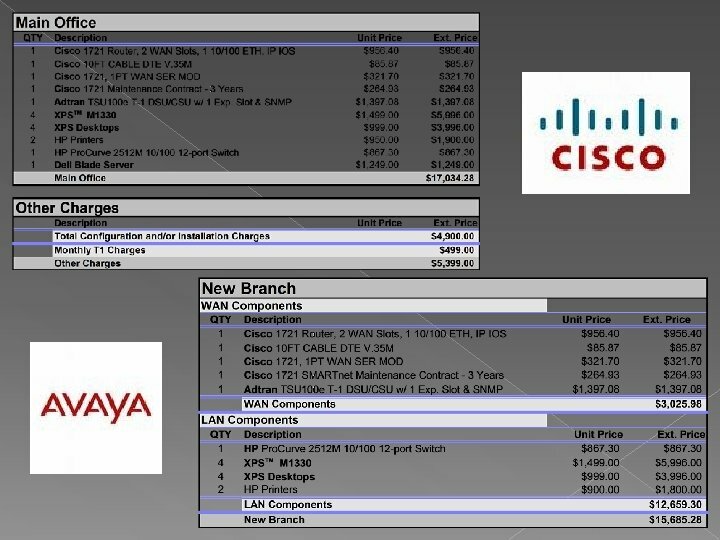 The technicians can provide the data but the CIO and others managers can use the OSI model to help discuss the expectations of network, cost of network equipment, location of bottleneck or problem with the network, and most important scalability/interoperability (growth/shrink, future/backward compatibility) To attain company goals ; network speed, and other expectations and parameters (which Dan will discuss)of the network are all variables and factors that determine network type, cost and performance. All of which is essential for managerial decision making. More Parameters Companies, such as movie and audio editing companies, who require large constant amount of network data transfer may use fiber optics at 1000 mbps. 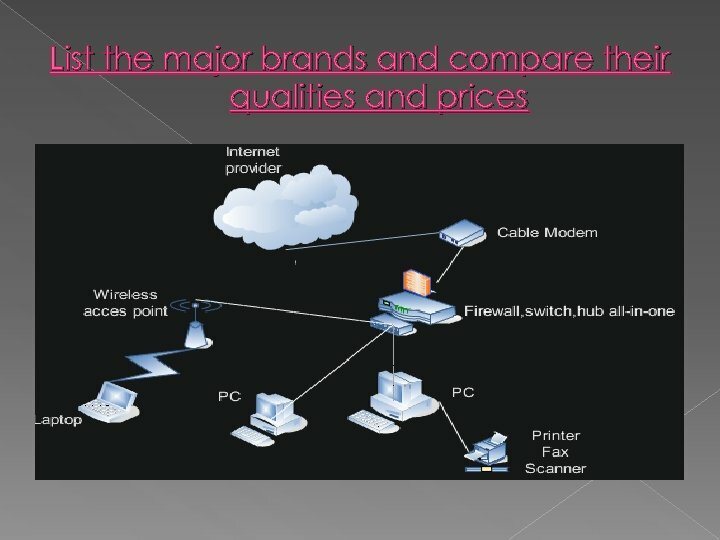 Internet and Wide Area Network(WAN), network in separate geographic locations, determine the speed and performance of sending/receiving information over the internet or to another branch office. 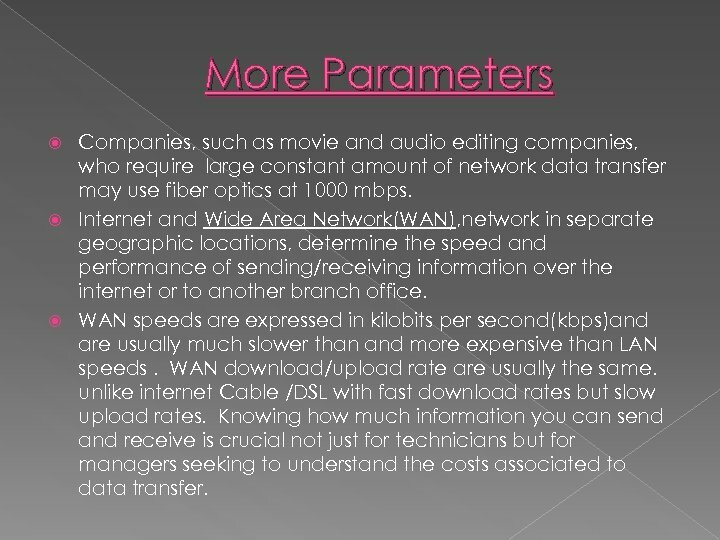 WAN speeds are expressed in kilobits per second(kbps)and are usually much slower than and more expensive than LAN speeds. WAN download/upload rate are usually the same. unlike internet Cable /DSL with fast download rates but slow upload rates. Knowing how much information you can send and receive is crucial not just for technicians but for managers seeking to understand the costs associated to data transfer. More Parameters The # of devices and connections a network can handle would be the capacity. An important piece of information a manager needs. The amount of data that can be transferred through your network in a given period would be your available bandwidth. Latency (delay of data to get to a location) affects Real. Time data. Virtual private network(VPN ) can be used on Confidential data, for secure connectivity over a VPN tunnel to another network on the internet or WAN. What manager do with the parameters These parameters help the manager objectively quantify and record the statistics on the network for proper analysis. Managers can discuss with the network technician the details of the necessary network type, network capacity, network speed and data type the network can handle. The network technician does not necessarily know what the company deems confidential or what data needs to be realtime. Managers on the other hand often have this information available. Usually More Bandwidth, more Capacity, Less latency, more security =more $$$, more devices, more labor and administration With all parameters examined and proper collaboration the manager can make an informed decisions to benefit the company’s network current and future needs.